Many riders get into group rides by joining a club. Here you’ll find people who’ve done this before, and usually someone else will plan the ride and lead it. So far, so good. One caution would be that most clubs have a certain type and style of ride, which makes sense. Any group will gravitate toward activities that have proved successful for that group. Harley-Davidson is famed, and rightly so, for their creation of and support of local HOG chapters. The Harley Owners Group offers a lot of positives, and one of them is the “bible,” an appropriately black book that details how things should be done, and what should not, and may not, be done. It is amazingly detailed. Anyway, HOG rides are extremely well organized. There’s always a “Road Captain” to lead the group, and another one at the rear. The RCs had to go through a lengthy training process to earn their title. They have also ridden the route prior to the ride. All members of the group are taught specific hand signals for various situations, and the rides usually go off without a hitch. Goldwing club rides, in my experience, were a little less rigid. Curiously, Valkyrie (essentially a stripped Goldwing) club rides tended much more toward a sport bike pace than a Goldwing pace. At the bottom of the heap were some sport bike club rides that started out at risky and quickly elevated past dangerous to approach suicidal. In my first ten years in the business I watched two sport bike clubs spring into existence, with matching vests and so forth. Both of them literally died out. Both were fond of meeting up at a bar late at night and then tearing off in the moonlight when the bar closed. Guess what happened? Not all sport bike clubs are like this, I hasten to add, as I led sport bike club rides for many years with very few problems. Club rides also have some drawbacks. Perhaps you would not like the pace of Harley club rides, which are utterly reasonable. Goldwing club rides tended to be on freeways, or at a very slow pace on back roads where many of the riders (again, in my experience) seemed to be uncomfortable. Perhaps you want to ride with a group of independent sorts. You hear about one and decide to give it a try. How do you evaluate the riders that show up? Motorcycle make: Makes utterly no difference. As long the bike is capable of freeway speeds it will be fine. Motorcycle condition: A key factor. Before the ride people tend to walk around and socialize and check out the rides. What do you see? The motorcycles do not need to be spotless, as mine usually is, but should show evidence that someone cares. Bald tires, floppy chains, and other marks or mechanical indifference are red flags. If many of the bikes are like this, perhaps you would do better to keep looking. 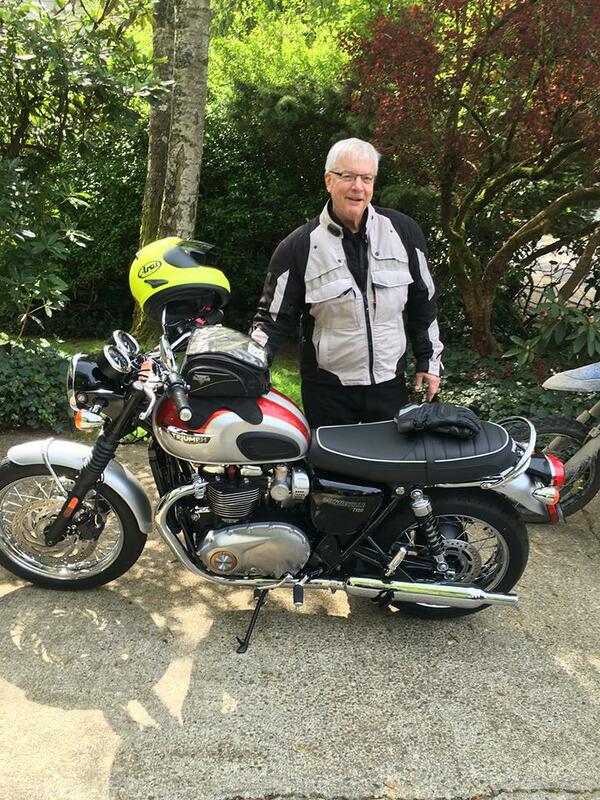 On one occasion I had a young man new to riding, on his new basic black Triumph Bonneville. At the lunch stop he misjudged the entrance to the restaurant, hit a small curb, and dumped the bike. Little damage to the bike, but crushing to his ego. He was embarrassed and ashamed, and assumed all would write him off as a total loser. Instead, the luncheon turned into a hilarious recitation of stories that all started with “You think that’s dumb? Here’s what I did…” I had one or two of my own tales of woe to add. By the end of the meal the young man felt much better about his situation, and everyone had a better time than if he had not been there. Women: The presence of women in a ride group will ALWAYS improve the experience, unless you have a troglodyte sexist pig in attendance, and in motorcycling I have found those to be rare, at least on a motorcycle day. Some of the women will be highly experienced and skilled, but many will be new to riding or at least new to group riding. Male chivalry arises from its cave and everyone wants to make the woman or women comfortable and welcome. Your experience may vary – this has been mine. In addition, the discussions at lunch will be more varied, in greater depth, and less profane. Passengers: Passengers are usually not a problem. Some will bring a child with them, and the kid will have a marvelous day. More often it will be a wife (I have never experienced a woman rider with a male passenger) and again, this will not be a concern, although the pace of a two-up bike will usually be slower. Gear: This is key. You can tell a lot about riders by what they chose to wear. ATGATT (All The Gear All The Time) is a good indicator. People will vary in their interpretation of ATTGATT, but at a bare (pun!) minimum look for a helmet, gloves, and a sturdy jacket and boots. Even the new rider of limited means should be able to scrounge up a jacket and some hiking boots and a pair of gloves to go with the helmet. Helmets are mandatory in my state. Curiously, there is a lot of data on the difference in accident outcomes between no helmet (not good) and helmet, but none that I know of on the difference between a high end helmet and the cheapo purchased at a discount outlet. In my $700 Arai I am safer than the guy in the $100 helmet, but not by as much as you might think. Evidently. Several years ago, because of this, a state senator in Tennessee got a bill through that made bicycle helmets legal on motorcycles in that state. As a motorcyclist himself and experienced with Tennessee heat and humidity he thought this would work well. It did not because motorcyclists did not like the look of bicycle helmets! I once took part in organizing a free demo ride day for Harley, and therein lays a disclaimer to the above. People showed up with all manner of helmets, some of them appearing to be 30 years old and moth-eaten. They matched these with sweatpants and tennis shoes. I spent the entire day in terror, especially after one man asked me to be sure to help his wife pick up the bike after she dropped it, as he was sure she would! The bikes were owned by Harley, not the dealership, and at the end of the day all survived. A lucky day. Pace: Early on in the ride you will be able to discern if the leader of the ride, assuming there is one, has a clue. The pace needs to be determined by a quick scan of the riders. I used to ride at a “sport bike” pace, a “touring pace,” or a “cruiser pace,” depending on my assessment of the group. By the way, I discovered early on in leading rides that I enjoyed all three paces, which surprised me. Some “leaders,” on the other hand, think that being the leader means they have to be the fastest bike in the bunch. If that is the case, drop out before the carnage and enjoy your day on your own. An experienced and/or caring leader will make a couple of alterations. For one, he or she will think before passing a slower vehicle on a winding back road. How will this affect the others? Sometimes waiting for a better opportunity makes a huge difference. At a stop sign, the leader may fiddle with gloves or face shield, or pause to comment to rider #2. A delay of 10 seconds or less will usually bring the group back together, even the new rider on the 250 at the back or the couples riding two-up. I think one of the most fun days I had was a group ride of ten to fifteen bikes I was leading, in the rain. Most of them were on sport bikes, and I, for whatever reason, was on a 650cc Yamaha cruiser. I did not want to hold the group up, so I thrashed the very willing Yamaha all day and had a wonderful time. You have to adjust to the needs and capabilities of the group. If you have a group where people are reasonable and friendly, wearing the right gear and of a mix of sexes and ages, you’ll have a fantastic day. If things seem a bit off to you, be bold and announce you just remembered your daughter’s soccer game and you need to leave. An actual daughter is not necessary for this. Secret tip – if you do have a great day, suggest a breakfast meeting at a restaurant of choice every Friday, or whenever. This can grow and shrink as people come and go, but over time you will develop a go-to list of friends to ride with. I started such a group when I retired, and it has been going strong for four years now. At all times, ride your own bike and at your own pace. There are lots of people out there who agree with you. The brand or model of motorcycle they adore is irrelevant. This entry was posted in Motorcycles. Bookmark the permalink.